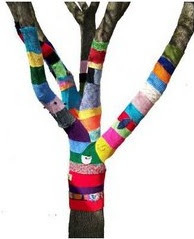 A smile-worthy tidbit for my public art loving soul (found via Modern Craft): a sweater for a chilly pear tree, knit by an entire community! 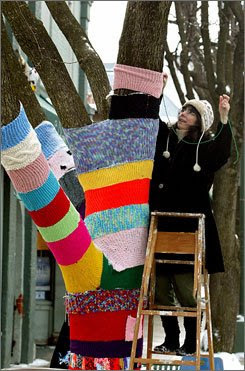 Knitters in Yellow Springs, OH joined forces to create this bright banding - sections of the "sweater" are interlaced with jokes, stories and mementos. Truly an eco-friendly alternative to carving your initials! The cozy is set to come down (hopefully with much pomp and circumstance!) on Arbor Day. Read more at Extreme Craft and USA Today.